Eye On Sports Media: Reader Poll: Should ESPN Have Pulled Craig James Off of the 2010 Alamo Bowl? Reader Poll: Should ESPN Have Pulled Craig James Off of the 2010 Alamo Bowl? ESPN College Football Analyst Craig James is the parent that got Mike Leach suspended at Texas Tech. ESPN Analyst Craig James is was scheduled to call the Alamo Bowl for the network. (ESPN has already pulled dim since the original post of these polls) Texas Tech is scheduled to play in the Alamo Bowl. So readers, you answer these questions. 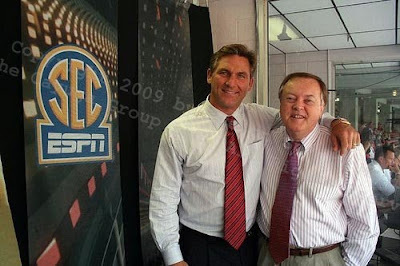 Did ESPN have a conflict of interest leaving Craig James assigned to call the game? Should they have replaced him on the coverage? University of South Carolina - University of Georgia kickoff on Saturday, September 12, 2009. Photograph Copyright 2009 by Eye on Sports Media/The Cayuga Group, LLC. All Rights Reserved.